What would cause someone who was a world champion in his sport and equally successful in business to want more from life? Is there life beyond the endless quest for fame and fortune? In conversations, coaching legend, Sir John Whitmore, mentions that when faced with such a dilemma and seeking answers he took the path of studying the emerging field, at that time, of humanistic psychology. Paths of transformation that lead him to learn Tim Gallway’s seminal Inner Game coaching concepts and apply them to businesses. As we all know what followed is rooted in the history of modern coaching. The need to transform is not restricted to our search for meaning in life or work. It could occur in more mundane situations, such as feeling ‘stuck’ in a role or when performing below one’s own expectations. The challenge lies in determining the nature of transformation and building the self-belief to make it happen. Roger Federer, arguably the greatest tennis player of all time, a few years ago passed through a phase of poor performance. Having the courage to take those hard decisions required for reinventing himself at his comeback to the top of the sport is now the story of legends. The root of all transformation lies in trusting oneself. Coaches can greatly support in the transformative process by helping their clients develop the self-belief to bring about the desired changes and also commit them to taking the responsibility to make those changes happen. Accepting the inevitability of Change, wouldn’t it be best that we seek to embrace and ensure that it moves us on a path to healthy and positive transformation? In his seminal work, ‘The Tao of Physics,’ physicist Fritjof Capra focuses our attention to ‘the laws of change that are innate around us.’ Capra mentions that ‘every subatomic particle is involved in a ceaseless flow of energy in which they are created and destroyed without end in a continual variation of energy patterns. It is a cosmic dance in which our participation is mandatory.’ He likens it to the ‘Dance of Shiva,’ the Hindu God of Destruction. In Hinduism, Shiva is a deity who represents transformation. Through destruction and restoration, Shiva reminds us that endings are beginnings, and that our world is constantly undergoing a cycle of birth, death and rebirth. By taking an eclectic approach of drawing on the disciplines like science, spirituality, philosophy, psychology and strategy coaching prepares us to deal with the challenges brought about by change and for discovering the wisdom that helps transform us to a brighter future. 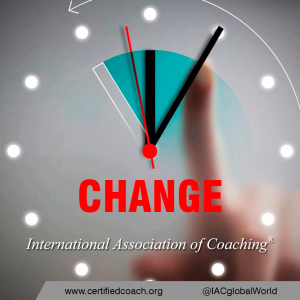 Over the past two years, consistent with our founder, Thomas Leonard’s vision that the IAC ‘lead the coaching world’, we have transformed as an organization in multiple dimensions to take coaching universal. We successfully launched our VOICE editions in Chinese and Spanish with more languages planned in the future. Our Quo Vadis, Coaching? webinars in English and Spanish were path-breaking in many ways and earlier this month, the IAC hosted our first-ever International Coaching Conference in Colombo that was attended by delegates from 13 countries. The Conference provided an opportunity for Master Coaches to mingle with their peers in a wonderful atmosphere of shared learning. The conference revolved around the impact on coaching posed by the movement towards a cyber- physical world. Would coaches need to adapt and adopt tools developed through artificial intelligence? Alongside researching these changes in the external world we also took the time to explore that basic tenement of coaching, which was bringing about transformation by managing Inner Change. On a personal front it is a time for change. While I am humbled to have the privilege to lead the IAC for the past two years, I now pass the baton of leadership to the very capable hands of my colleague and good friend, Pepe del Rio, who takes over as IAC President from January 1st, 2018. Master Coach Pepe, who is based in Mexico City, brings a deep commitment to coaching and the IAC. And will lead a hugely competent multinational, multicultural team that constitute our Board of Governors, who are backed by a community of volunteers located across the globe selflessly supporting all our initiatives. They have been the back-bone of the IAC and I would like to thank each of them for their untiring and immeasurable support in these past two years as also the global IAC community for their contribution to the world of coaching. Coaching is that rare profession where success or satisfaction is measured vicariously through the actions and feelings of our clients. We walk alongside them through experiences and situations, support them in navigating a wide range of emotions, help them build stronger relationships, search for more engagement at their workplace and discover deeper meanings in life. While joining in celebrating our client’s accomplishments, it is possible that we might question if they have truly met their aspirations and goals; whether their measure of success translates to a feeling of inner fulfilment and joy? In the past decades, there has been considerable research in the field of Positive Psychology that seeks answers to questions such as these. The founding father of Positive Psychology, Mihaly ‘Mike’ Csikszentmihlayi laid the foundation in his seminal work on the Flow State. In recent times, Martin Seligman expanded on the concept of Flow by introducing the PERMA model where he believes that these five core elements (Positive Emotion, Engagement, Relationships, Meaning and Accomplishment) can help us reach a state of authentic happiness. Mankind’s quest for happiness is a deep rooted one. In the early 1940’s when Abraham Maslow introduced the ‘Theory of Human Motivation’ he listed the five hierarchies of needs that are familiar to all of us. It is interesting that these five needs were later expanded by other researchers to eight. The eighth need was described as the ‘Transcendence need: helping others to achieve self-actualization,’ which arguably is an apt definition for coaching. In the IAC® we intend to continue this fascinating conversation by conducting two exciting events. On 22nd November, 2017, in our Quo Vadi, Coaching?s webinar, we host two experts, Devdas Menon and Paul Pahil who will share their thoughts on the topic of Inner Fulfilment. We welcome you to Colombo and starting on the path to discovering joy and Inner Fulfilment. Meanwhile please share your thoughts with me at president@certifiedcoach.org . Life is Beautiful (‘La Belle Vie’)! 克里希納·庫馬爾(Krishna Kumar)是Intrad學校的創始人與執行者，是印度高階教練（ ISEC ）及領導力和執行力教練領域的先驅。他堅信，學習教練的最佳方式 就是 過往三十年，戴著各式的 帽子引領著他經歷各式各樣的學習之旅，包含擔任企業高階主管、企業家、網球教練，商學院教授、獨立的董事會成員和 高階教練。旅程持續中..